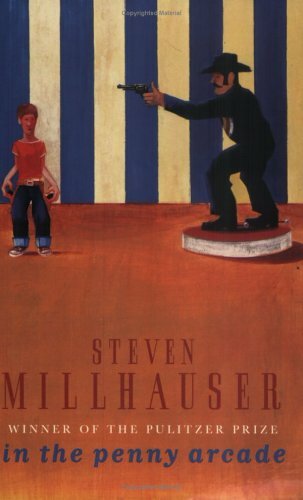 Steven Millhauser wrote this book. He's an American writer whose stories are alive with what I'd call a particularly American brand of magical realism. (You remember that time I talked about magical realism? Of course you do. )What the hell does that mean? Well, his stories take ordinary events that smack of the typical fifties-to-seventies-ish American experience (a high school party, a snow day, a rustic New England inn, a day at the beach, the titular penny arcade) and infuse them with, well, a sense of wonder and a sense of the weird. He's like Ray Bradbury, almost, with all the science fiction stripped away. His view of the universe is vivid, colorful, poetic, and tinged with mystery and curiosity, whether he's writing the world of a twelve-year-old boy, a teenage girl, a woman growing older and alone, a reclusive genius, whatever. He writes each of them individually and convincingly, but over them all arches the same kind of sky, a sky in which the light means something a little more. I've never read anything else he's written, so I can't comment on it, but there is a really awesome interview with him here that sheds some light onto the intricacies of his mind. It also makes me want to read his other books, as much or more as reading this one did. SM: ...when things are going well, the feeling I have is much more extravagant. It’s the feeling that I’m at the absolute center of things, instead of off to one side—the feeling that the entire universe is streaming in on me. It’s a feeling of strength, of terrifying health, of much-more-aliveness. It’s the kind of feeling that probably should never be talked about, as if one were confessing to a shameful deed. The stories are about the ordinary world at the moments when it passes into something deeper, wilder, or stranger. Sometimes nostalgic, sometimes frightening, sometimes simply painfully beautiful, each moment of perceptual shift passes through the eyes of the main characters (and so, too, us readers) and fades away again, leaving behind a tingling resonance of wonder. The stories are often about the potent nature of the world as it was understood in childhood, but they lack the silly sentimentalism that so often gets written into stories that attempt to recapture the magical nature of things we saw as kids. There's a lot of beauty and a certain amount of dazzlement; there's not a lot of vaseline on the lens. More than anything it reminds me of I Sing The Body Electric! and yet each story - excepting maybe "Cathay," which actually recalls Italo Calvino's Invisible Cities - is far more intensely grounded in the world-as-it-is. Ray Bradbury gives us strangeness via scientific wonder; Millhauser writes a very similar strangeness, but it's more like an old-fashioned magic trick or a sudden cloud over the moon. Ah, this is a wherever book. Especially good, maybe, for dusty corners and seemingly boring places. You never know what might get illuminated. Which is not the same as this lovely film, although they share the same name and a magician for a main character. Watch them both; they are delicate, elegant works of beauty and sweetness of feeling. Have a weird and wonderful holiday weekend! But none of that is why I'll be reading your recommendation. Millhauser owes YOU for my read, or more accurately, your words. Thank you for giving me such a warm, hopeful, honest feeling in the center of my being in telling me of another's work. And seriously, Stevie-boy---as magical as I expect your book to be, you still owe her.